We called and you responded. We called and you responded. We had put out a statement and called for creative artistic responses to what is happening in Charlotte. And we received ~18 new entries in the 3 days, with several more people wanting to participate if there was more time. First of all, thank you! We are humbled, and frankly, overwhelmed by the response. In a city still coming to terms with the recent happenings, it feels like we have become the unlikely “First Responders” of the art scene. And in a place which suffers from a lack of trust, we are grateful for the trust you have placed in us as a safe and welcoming place for your voice to be heard. We don’t take the opportunity/responsibility lightly. While we don’t have enough time on the 20th to showcase all the wonderful ideas/proposals for presentations we received, we are seeking ways to see how we can include even more ideas and viewpoints, and continue this connversation – and would love to hear your thoughts on that. In the meantime we are very excited to announce the lineup for Vol. 16. It is a truly exceptional group of people – and also by far the most diverse lineup we ever had – not just in terms of race, but also age, topics etc. We will have not one but two awesome Emcees this time: Judith Barriga (Latina 102.3 FM), will join our regular star MC, Quentin Talley. Of all the events/programs we have done over the years, this could be the one with the most urgent relevance yet. We want you to be there, and help us figure out how we can continue and expand on this. Please help spread the word. Entry: $10 at the door. Cash bar. Thanks to Creative Loafing for picking BOOM to be “The Best Performing Arts Extravaganza” in their current Best of Charlotte 2016 issue. We have started work on BOOM 2017, which should be even bigger and better – find out more at the PK on the 20th. Posted in Events, Presenters | Comments Off on We called and you responded. A few weeks ago we announced our objective to take the long running Pecha Kucha Charlotte (PKNCLT) series in a new direction, to be more intentional about being inclusive, and to extend the open platform for creative expression to those in the community who have traditionally been left out from the cultural and creative resources of the city. We had invited applications to present (in English or Spanish) at our first bilingual PKNCLT on Oct 20, titled Art without Borders/Arte sin Fronteras. Then things unfolded this week that delivered an urgent reminder to all of us about the borders that exist within our city. We are not an activist organization – we are only a small grassroots collective of artists, designers and other creative professionals, who come together to try use our talents for the greater good. But there comes a time when one cannot remain silent, neutral or inactive; when one loses the privilegie of turning away from what is happening to one’s fellow being, and seeking refuge in one’s art. We are reopening the call for entries to present at the Oct 20 PKNCLT and extending the deadline to next Wed, 9/28. And we are seeking presentations/performances that address what is happening in the city right now, its underlying causes – and fresh approaches and mindsets that can create new outcomes and possibilities for everyone. We want to hear all voices: black, brown, white, native, immigrant, Spanish, English… let’s share our realities, let’s connect through the common language of art, let’s lift our voices together. We believe in the power of art, in its ability to transcend boundaries and transform lives. We also believe in living and creating in a city that is welcoming to and supportive of everyone irrespective of their race, background and income. Please participate, please spread the word, and please show up. Deadline for submissions: noon on Wed, 9/28. 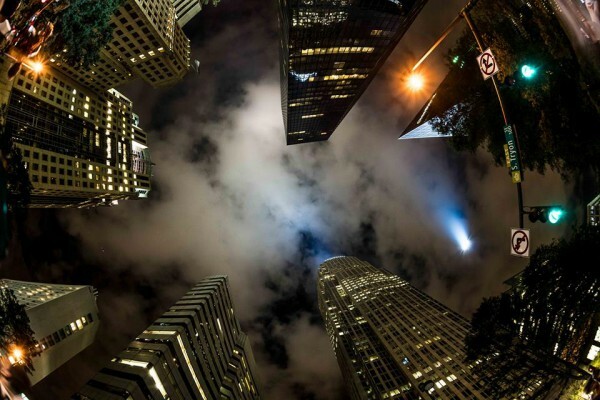 Pecha Kucha Charlotte is back with the Fall volume. And with this one, we are coloring outside the lines. #PKNCLT has been convening the creative community for evenings of engagement, inspiration and fun since 2008. Over 15 volumes we have showcased ~300 presenters, and sparked numerous artistic collaborations as well as critical and creative conversations. And our wonderful and loyal audience have made each night special and unforgettable! Going forward we want to be even more intentional in extending our platform to those in our community who have been left out from such creative conversations. Vol. 16: Art without Borders will be the first in our new initiative – and to start off, we will test our taste for the romantic Latin tongue -en Español-. We will host presenters/performers who will give full presentations in their native tongue. …for sending in the final presentation package: 5:00 PM on Friday, Sept 23. ¿Tienes preguntas acerca de la presentación? | Got questions about presenting? Please note: We will be limiting the total number for Vol.16 to 10 presentations. A panel made up of artists and designers will be selecting the final list of presenters. The selection will bebased on the quality of the entries, and the originality of thetheme/ideas submitted. We also try to ensure the inclusion of a really wide range of media and topics. See who is presenting at PK v.14! * A Fond Farewell to Chop Shop: As you might know, the popular venue will be shutting its doors forever a few days after this event, as the whole complex is to be torn down and redeveloped. So this will be our last PKN at the funky, gritty venue. Be there to celebrate one last time! 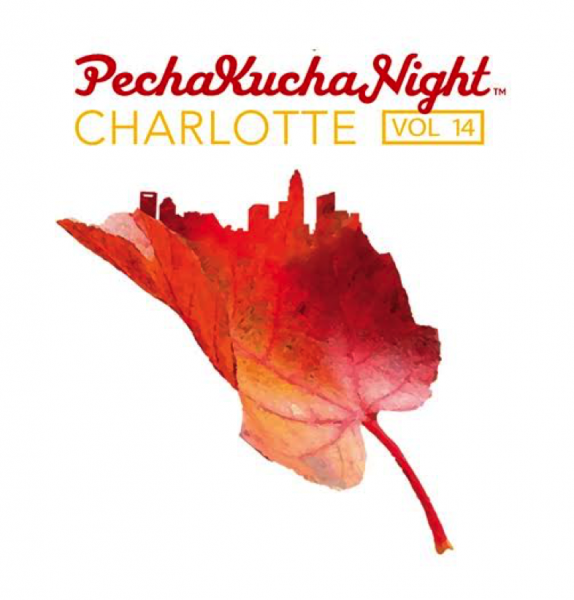 Volume 14 of Pecha Kucha Night Charlotte is organized by Que-OS. Pecha KuchaTM is devised and shared by Klein Dytham Architecture, Tokyo. Posted in Events, Presenters | Comments Off on See who is presenting at PK v.14! Posted in Events | Comments Off on Present at the next Pecha Kucha Night ~ V. 14! It promises to be a night of compelling presentations and unforgettable performances. Come hang out, grab a beer, socialize, be challenged and inspired. Parking: Please see the parking instructions: www.amossouthend.com/parking/ We also encourage you to ride the light rail – Amos’ is right next to the Bland St. station. Volume 13 of Pecha Kucha Night Charlotte is organized by Que-OS in collaboration Queen City Forward and is supported by the John S. and James L. Knight Foundation. Pecha KuchaTM is devised and shared by Klein Dytham Architecture, Tokyo. The line between art and activism is getting more and more blurred, as artists increasingly are trying to tackle social, environmental and community issues through their art – and those working on causes are finding unconventional and creative ways to share their message and arrive at solutions. Yet the artistic and the social entrepreneurial communities in Charlotte remain mostly unconnected. Now Que-OS is collaborating with Queen City Forward (QCF) to bridge that divide, and we are starting with a special Pecha Kucha Night that focuses on the confluence of the two fields. Why should artists do it? Come out on Tue, Feb 24, at 6:00 to the McColl Center for Art & Innovation, socialize, meet with social entrepreneurs as well as other artists/performers/designers. The final event – the Pecha Kucha Night – will be on Thu, April 30, at Amos’ Southend. Between now and February 23 RSVP and let us know you’re interested in participating in a entrepreneur/artist collaboration. On Tuesday, February 24 we will meet at 6:00 at the McColl Center for an evening of “speed dating” where entrepreneurs and artists can meet and find potential artist/performer/designer collaboration partners for the April event. You will have until April 10 to prepare a proposal for your Pecha Kucha presentation. Our panel of jurors will select 10 presentations to participate in Pecha Kucha Night on April 30. Volume 13 of Pecha Kucha Night Charlotte is organized by Que-OS, in collaboration Queen City Forward (QCF), and is supported by the John S. and James L. Knight Foundation. Pecha KuchaTM is devised and shared by Klein Dytham Architecture, Tokyo. 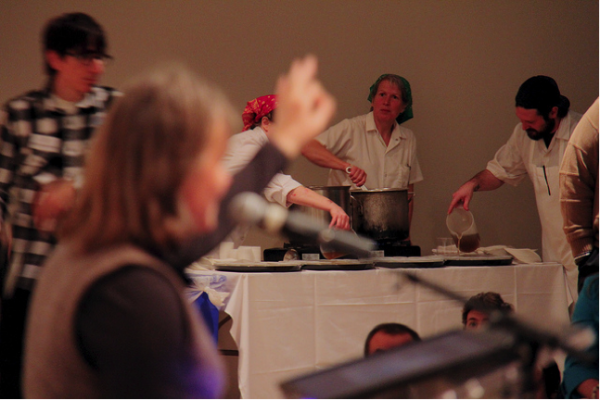 What is a Pecha Kucha Night? Pecha Kucha 20×20 was created in Japan as a platform for artists to share ideas and has grown into an international sensation, involving over 600 cities. The format is simple – 20 images x 20 seconds, for a total of 6 min 40 sec. This keeps the night moving and inspires audience engagement. 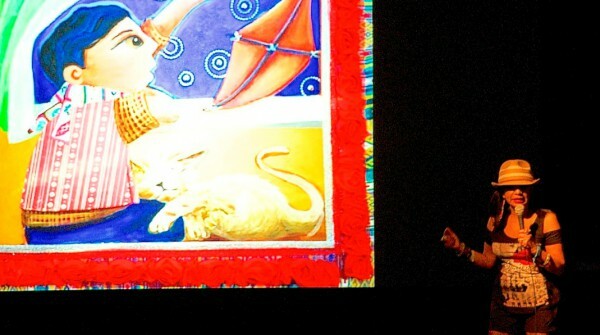 PKN Charlotte was started in 2008 and has done 12 volumes so far. Over the years it has grown into the largest multi-disciplinary showcase in town, and brings together a highly diverse range of creative people and audiences of over 400. 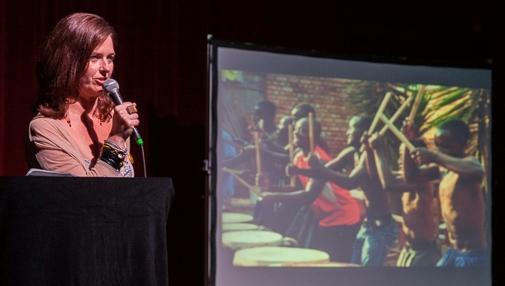 “Pecha Kucha… has become Charlotte’s most popular and electric gathering of creatives.” – Charlotte Magazine, in blurb for the Best of the Best (BoB) Awards. Once again, we are excited to present a very diverse showcase that includes visual art, dance, theater, and a lot more, by some of the leading practitioners from this region – all that at one of Charlotte’s most beautiful venues! Volume 11 of Pecha Kucha Night Charlotte is organized by Que-OS, and is supported by the John S. and James L. Knight Foundation. It is made possible, in part, with funding from the Arts & Science Council. Pecha KuchaTM is devised and shared by Klein Dytham Architecture, Tokyo. The next Pecha Kucha is coming up soon, and we will be back at the Mint Uptown. Plus, this could be your last chance this year! We plan on doing one more PKN this fall – but that will be a special one around a theme (more details to come soon) – so this will be the last “open call” for presentations this year. …for sending in the final presentation package: 5:00 PM on Friday, May 16. Please note: We will be limiting the total number for Vol. 12 to 10 presentations. A panel made up of artists and designers will be selecting the final list of presenters. The selection will be based on the quality of the entries, and the originality of the theme/ideas submitted. We also try to ensure the inclusion of a really wide range of media and topics. Volume 12 of Pecha Kucha Night Charlotte is organized by Que-OS, and is supported by the John S. and James L. Knight Foundation. It is made possible, in part, with funding from the Arts & Science Council.